Why Do I Have Neck Pain? Upper Cross Syndrome Explained. Stuck working at a desk all day? Experiencing neck or shoulder pain? 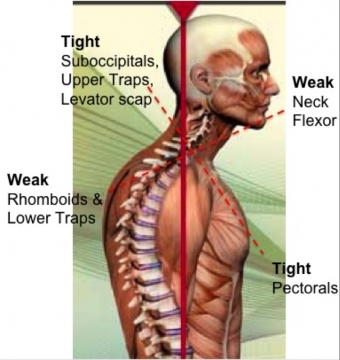 Poor posture from our electronic devices, reading, and driving, can lead to a lot of upper body dysfunction of the neck, shoulders and thorax- commonly seen with upper crossed syndrome (UCS). Rounded shoulders, with a forward tipped shoulder blade, and forward poking chin, characterize this issue. UCS is also known as: forward head posture, student syndrome, and slouched posture. This posture leads to shortened (overactive) and lengthened (underactive) opposing muscles in a crossed pattern, as seen in the picture here. It is not usually serious, but chronic issues of pain and damage to the muscles mean treatment is often wise. These issues can lead to movement restrictions, pain and alter your ability to participate in the activities you enjoy. Knowing the right muscle groups to stretch and strengthen is key. Lying on your back with a pillow under your midback, OR, lying on a full-length foam roller lengthwise with arms resting at your sides (similar to corpse pose in yoga). Upper back strengthening exercises, such as shoulder blade squeezes. Practising good posture at work, home, and in the car. Learn how our physiotherapists can help you get back on track, or prevent this common problem from being one you face! I refer to myself as an educator first, and a chiropodist/foot specialist second, because I believe that if you understand your foot conditions and how to take care of them, you will be able to have better foot health.